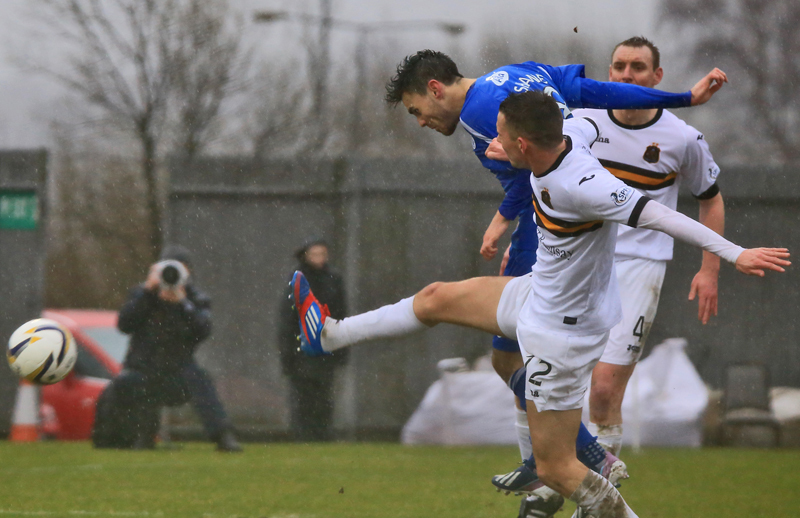 Queens toiled in a disappointing draw with Dumbarton on a rainy day at the Rock. James Fowler`s men were frustrated by the Sons despite regaining fourth place in the Championship after a dull 0-0 affair. The disappointment was compounded by Referee Steven McLean in the dying minutes as he sent off Derek Lyle for an alleged altercation. Prior to Saturday`s meeting, the Sons had shipped seven goals against the Doonhamers so far this season, with a 4-0 thrashing at the start of the season setting up a good run of form for Queens. James Fowler made one change to the side who narrowly missed out on a point against Champions-elect Hearts last Saturday - with Paul Burns making way for the returning Ian McShane. And the midfielder had the best chance of the first half after 22 minutes when his header cannoned off the post. Derek Lyle swung in an enticing delivery and McShane raced on to the end of the cross before watching his header fly by Dumbarton `keeper Danny Rogers. The 22-year old - along with the sizeable travelling support - thought the ball was in the back in the net. Three minutes later, McShane was back in the action, this time with an ambitious effort from 30 yards out. 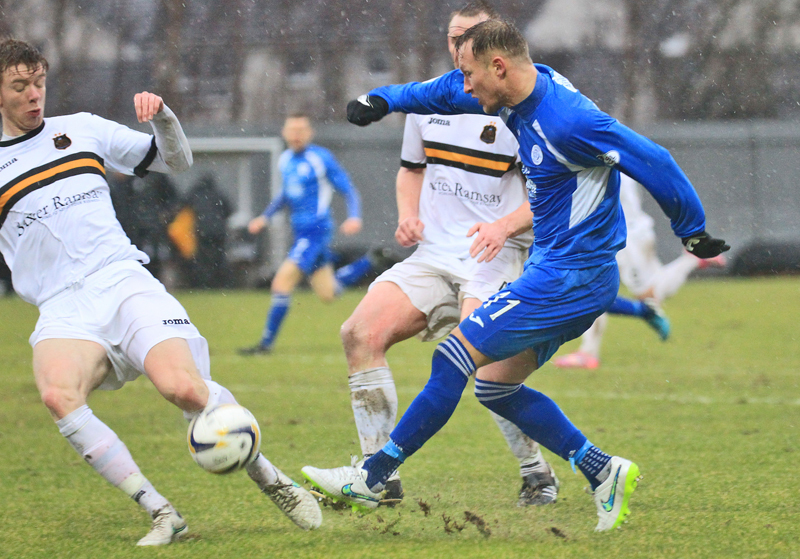 In truth, Queens were limited to pot-shots from long range as Ian Murray`s men set up to frustrate the Doonhamers. Just before the half time whistle, Mark Millar blasted wide of the mark from the edge of the box with a strike in a similar vein to McShane`s effort. As the rain continued to fall throughout the second half, the quality on show failed to improve, as both sides struggled to adapt to the worsening conditions. Dumbarton almost took the lead on 53 minutes as Mark Gilhaney blasted from the edge of the box, forcing Zander Clark in to his first save. In reality, both `keepers weren`t overworked but the save of the day came from Dumbarton stopper Danny Rogers just before the hour mark. McShane picked up the ball on the half way line and linked up with Millar and Carmichael on the edge of the box before driving in to the box. A fortunate ricochet set up McShane one-on-one with Rogers who pulled off a stunning save from close range. It was a sign of Queens` day that they just couldn`t find a breakthrough. After the hour mark, Queens gaffer Fowler tried to freshen things up with the introduction of Paul Burns and Iain Russell but Dumbarton - along with the persistent rain - continued to put a dampener on any attacking play. 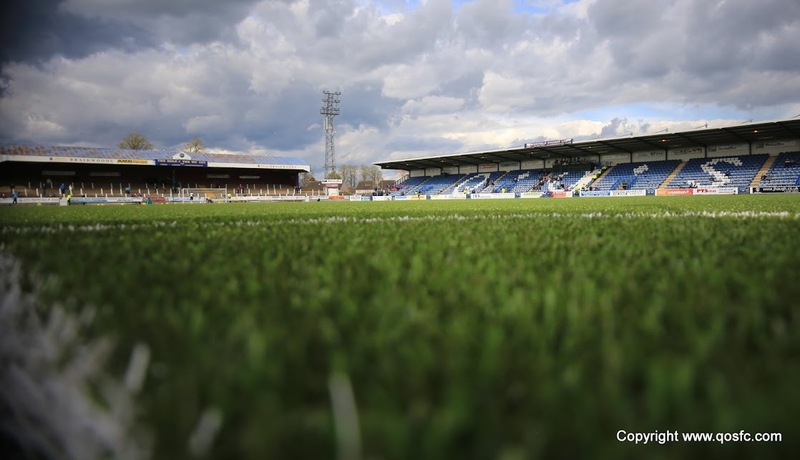 Bookings for Chris Higgins and Mark Durnan also added frustration for Queens as the defensive duo will miss out on league action through suspension. As the game started to become an ugly affair, things went from bad to worse for the Doonhamers as Lyle was sent off. An off the ball clash between Archie Campbell and the 34-year-old prompted whistler Steven McLean to give Lyle his marching orders - and ruling the striker out of Friday`s Cup clash with Falkirk. Dumbarton almost fired home a late winner as Stuart Findlay`s effort bounced around the box before missing Clark`s left hand post by inches. It would have been harsh on Queens and in reality the game didn`t deserve a goal. Queens jumped above Falkirk on goal difference with a game in hand but it will seem like two points dropped rather than one point gained by James Fowler. However, there is little time to reflect on an unmemorable game as Falkirk visit Palmerston on Friday night for the Scottish Cup quarter-final. 14:09 Good afternoon from Dumbarton, today`s match is a 3pm kick-off. We`ll do our best to post updates throughout the match. Half Time Not much to shout about in the first half in Dumbarton. 0-0.